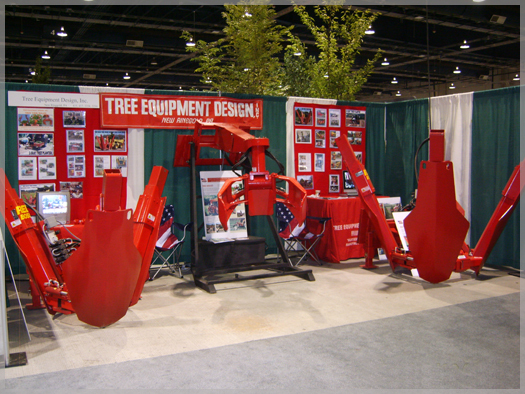 Tree Equipment Design, Inc. offers a complete line of landscape and nursery equipment for the industry today. When you buy equipment from Tree Equipment Design, you will get expert advice based on over 22 years of combined landscaping and nursery business experience. You are sure to find exactly what you need and can afford in our diverse selection. As the landscape and nursery industry faces the challenges of rising production costs and increased competition, Tree Equipment Design stands beside you to continue to help you the customer develop your business and increase your profits. We are committed to providing our customers with the most innovative equipment and unsurpassed service you can find. Remember all of our landscape and nursery equipment is manufactured in New Ringgold, PA, USA. We are still the hometown manufacturer where you talk to a live voice and not an answer machine or recording, during our business hours of 8:00 am to 4:00 PM. You can order your parts and/or accessories and receive in a few days depending on your shipping (delivery) zone. Tree Equipment Design, Inc. reserves the right to make changes in engineering, design, specifications, and prices without notice and without incurring any obligation relating to such change.